If we’ve learned anything about James Franklin during his now four-season tenure at Penn State, it’s that he’s going to do things his way. And there can be no debating that his methods, even if some of them are a significant departure from the past, have been wildly successful. On this weekend a year ago, when the Nittany Lions returned from their Big Ten opener at Michigan on the wrong end of a 49-10 score, almost no one could have predicted what has transpired since. Franklin is fresh from the 2016 Big Ten championship and now has the Lions ranked No. 4 and positioned as the early favorite to win the Big Ten East. Obviously, Penn State fans have bought in, and there is no greater evidence than the 102,746 who showed up last Saturday night to see the scrimmage against Georgia State. This was the third-straight home game, let alone a 7:30 kickoff. In days gone by, the attendance would have been closer to 90,000. But people are enjoying watching this team, certainly watching Saquon Barkley along with Trace McSorley and their big-play teammates. Those big plays have shown success can come through different methods. Not all championship programs have to be built around defense and special teams, although the Lions have performed well in those areas. Clearly, though, this 13-game stretch of pinball scoring and streak of 12 straight regular-season victories, have come as a result of the offense. While his Tuesday press conference was wrapping up, Franklin addressed the style, surely to make a point with some who wonder if the Nits’ reliance on big plays will eventually catch up with them. “We’re an explosive, big-play offense in the passing game and in the run game,” he said, “and if you’re looking to watch a three-yards-and-a-cloud-of-dust offense, then this probably isn’t the scheme for you. That especially applies, he said, to short-yardage situations that often call — or use to call — for tight formations. Franklin likes the fact that the Lions have “owned who we are,” even if it’s broken traditional molds. Which leads us to tonight’s game at Iowa and a fascinating matchup in terms of style contrasts. Penn State, because of its quick-strike mentality, is ranked 125th of the nation’s 129 Division I-A teams in time of possession at just 24:07 per game. For the second straight week, the Lions only snapped the ball 53 times. You have to go back to Bill O’Brien’s first year, 2012, to find a smaller number (49 vs. Army, a 34-7 win, BOB’s first). And yet these Lions average 47 points per game. On the other side of the ball, Iowa, also 3-0, is succeeding its way — by controlling the clock. The Hawkeyes are sixth in the nation in time of possession at 35:35 per game. Then again, one of the nation’s most explosive teams, Oklahoma State, is 112th in time of possession, and Pitt, which lost at Penn State 33-14 and couldn’t stay on the same field (its own) with the Cowboys, ranks 11th in TOP. So will something give today? Maybe not. Maybe Penn State will continue getting Barkley in open space and freeing big pass plays downfield that light up the scoreboard without eating the clock. 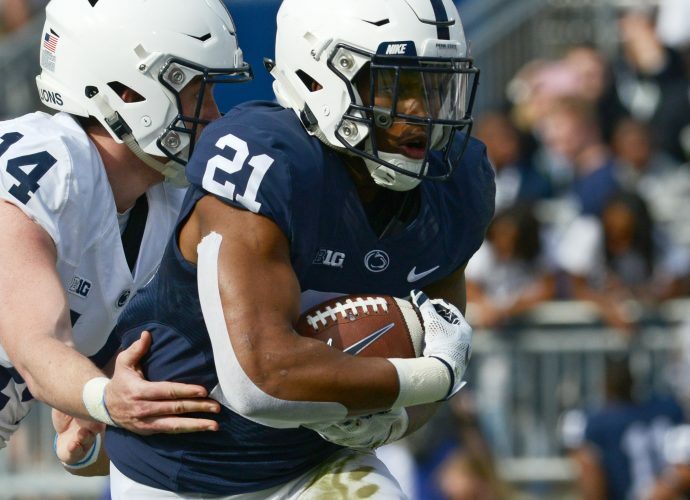 Iowa, no doubt, will try to keep the Nittany Lions’ offense off the field and pound away with a run game that Penn State hasn’t been great at stopping. But if the oddsmakers are right, the formula will add up to a two-touchdown Penn State win. The best offense in Penn State history was 1994. That team scored quickly but still averaged 68 plays per game. Will 53 plays be enough again tonight? It has been so far.